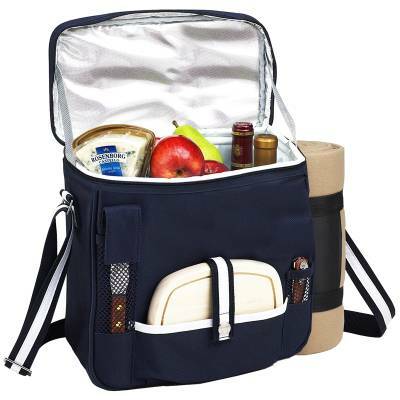 This unique wine and cheese cooler with attached blanket, is Thermal Shield insulated to keep food and wine at the perfect temperature. It features quality construction and an adjustable shoulder strap to carry. The set includes (1) Corkscrew, (1) Cheese knife, (1) Hardwood cutting board, and (1) Blanket with detachable carrier. The cooler area is divided with three separate sections, 2 for wine bottles, and one larger area for food. The wine bottle divider is secured by Velcro and can be detached to create one large cooler area if desired. This attractive cooler has a leak-proof lining and adjustable shoulder strap.